If you have wanted to wear the beautiful Hanbok, autumn is the perfect season to do so! It is not to hot and humid and also not to cold, so you can comfortable wear the Hanbok while posing in front of the stunning autumn foliage around Gyeongbokgung Palace. Korea is famous for its stunning autumn foliage, which leaves the entire country painted in stunning shades of bright red and orange. There are beautiful spots to enjoy the mesmerizing foliage, such as the famous Seoraksan, Gyeongju and Naejangsan. 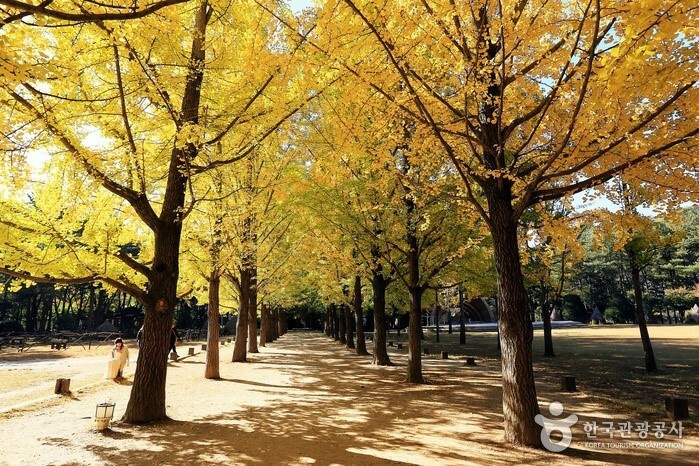 A trip to those destinations will let you experience the true beauty of autumn in Korea! The Busan International Film Festival is the largest and most important film festival in Asia. All your favorite actors and actresses attend this event and award-winning domestic and international movies are screened. This is THE Must-Go Event for movie lovers! At every time of the year, Nami Island will not disappoint. Autumn is no exception. 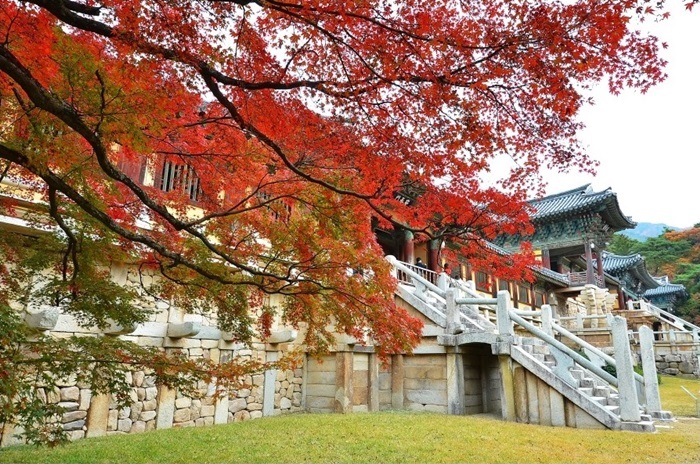 The beautiful Island, which was the shooting location of the popular Drama “Winter Sonata”, is painted in shades of orange and red. Wandering around, you might encounter adorable animals who freely live on the island. This spot is particularly popular among couples, families with children and photographers! 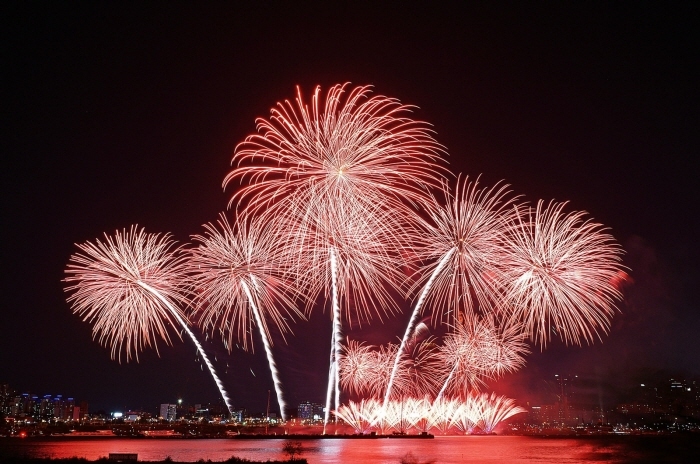 The world-famous firework professionals create a spectacular firework lighting up all of Seoul and attracting thousands of visitors. The event is accompanied by laser shows, stage performances and much more! The refreshing autumn weather is just perfect to explore Korea’s impressive hiking trails. 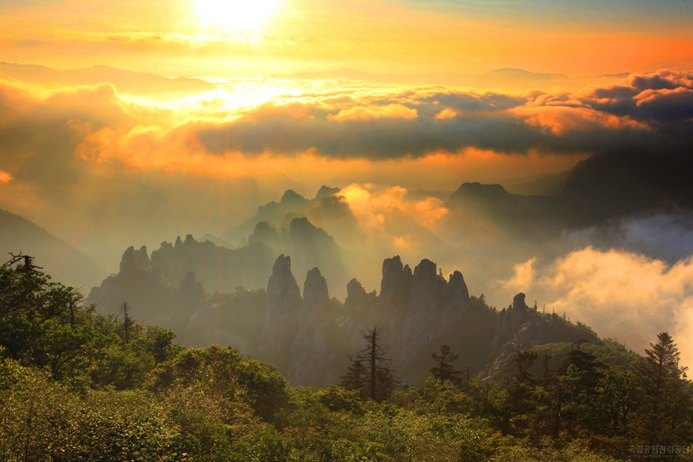 Even if you stay in Seoul, you can do a 1 Day Hiking Trip to Bukhansan Mountain, which will provide you with captivating views on the natural scenery. Or if you want to see the beautiful silver grass in full bloom, autumn is your only chance! 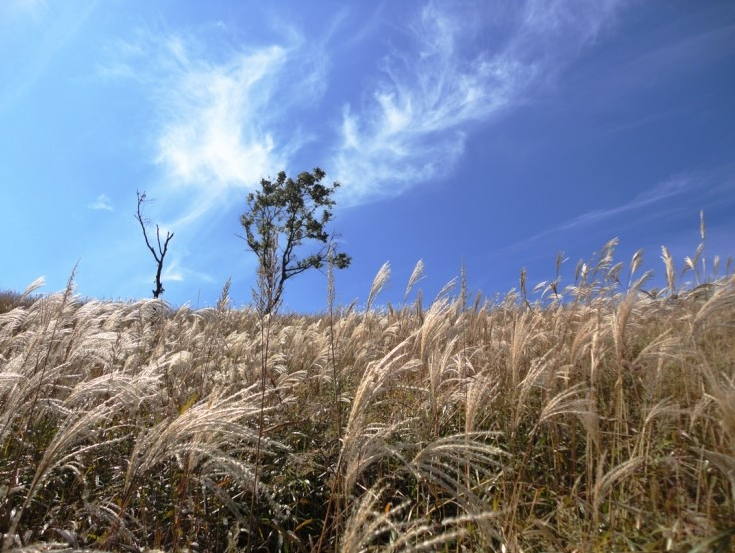 The most stunning views on silver grass fields waving in the wind can be seen at Myeongseongsan Mountain. Fall is the harvest time in Korea. This means that Koreans celebrate Chuseok, the big harvest festival, and savor delicious seasonal dishes. The major autumn fruit in Korea is persimmon. Besides the high levels of vitamin A, B, C and minerals, persimmon is good for the skin and very delicious. You can also eat it as ice dessert or in drinks, jam and salad! Korea in Autumn: Delicious Persimmons! Jeju Island is unarguably the most beautiful part of Korea. The Island is the Number 1 spot for Korean honeymoons. You can relax on beautiful beaches, hike on majestic mountains, discover off-the-beaten tracks and much more! The local cuisine is definitely worth an experience as well. 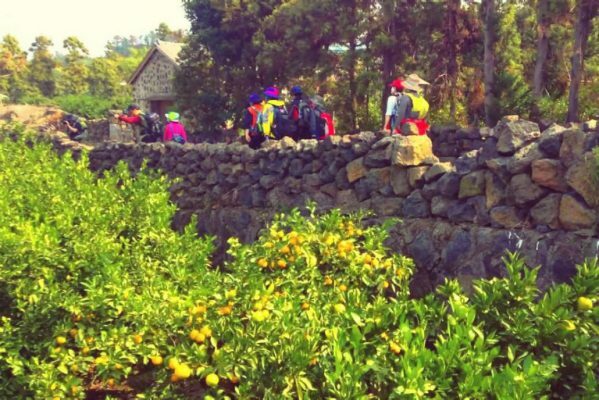 Luckily, autumn is said to be the perfect season to visit Jeju Island. It is warm enough to relax on the beaches but not too humid. If you have the chance, we highly recommend visiting Jeju Island in Autumn! 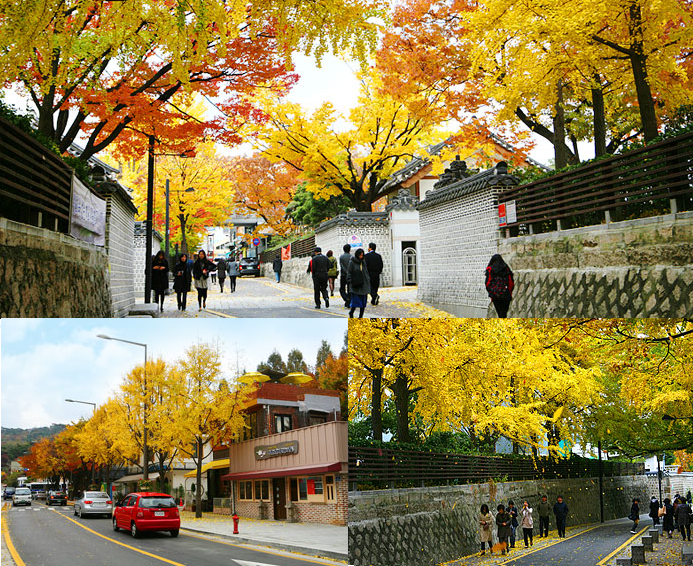 The Garosu-gil Gingko tree-lined street that runs from Sinsa Station (Subway Line 3) to Hyeondae high school is a popular, upscale street in Seoul. The street (also known as ‘artists’ street’) has an eccentric flair thanks to its variety of charmingly decorated coffee shops, and designer stores. It is the perfect spot for an afternoon stroll when you want to visit hip boutiques and pretty cafes. Garosu-gil is particularly popular in autumn when the leaves begin to fall! It may be surprising but in the past this area was a massive disposal site. In fact, Seoul transformed itself into a beautiful green space when they got were hosts for the 2002 World Cup. In this way, a network of six large parks has been created on the mounds around the World Cup Stadium, remodeling it into a much more welcoming area. The Sky Park (or Haneul in Korean) is the highest one among them, with good observatory points. It enables visitors to take in the fantastic views of surrounding mountains and rivers. Due to the blooming silver grass, the Sky Park will be the most beautiful in October. 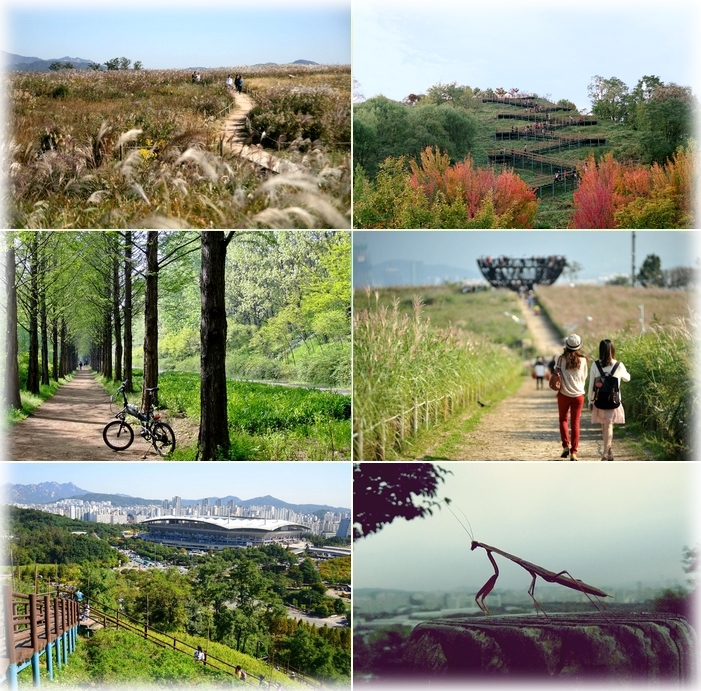 Korea in Autumn: Take a walk in the beautiful Sky Park!